Crafted from Fairtrade 9 carat rose gold, this timeless eternity ring features a selection of beautiful round brilliant cut diamonds. 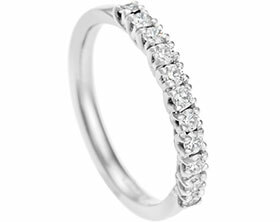 The 3mm wide band pinches in at the centre to create an elegant shape whilst also splitting the front of the ring into two sections which have each been pave set with diamonds. A row of sparkle is created across the front of the band thanks to a total of sixteen round brilliant cut G-H VS1-2 diamonds which vary in size from 1mm to 2mm. The band has a flat profile with softened edges to ensure a comfortable fitand it has been completed with a polished finish.